Nicole just suggested em for our minimalist, and I honestly can't tell if they are genius or hideous. i like 'em. i guess. they're not hideous, but the minimalist should be wearing flats. i just ANTICIPATED your comment and added a third option. Something off about the heel. I like the rest, just not the heel. I agree. It's just not right. too clunky/chunky/the gold is weird. ... plus they're not minimalist. why are we all denying the existence of wedges? getting married on a beach or grass and not wanting to have dumpy flat legs = WEAR A WEDGE. I prefer a tapered heel; this one is just too chunky. And too tall, though I can barely walk in heels, so that's just me. i can't quite put my finger on what, exactly, i don't like about these. funny thing is, i really liked the pair you posted previously -- also chunky and pastel. hmm. i figured it out. there is no curve AT ALL to the silhouette of the heel, while the ones in the previous post do curve EVER SO SLIGHTLY. shoes like this tend make my feet look even bigger and clunkier than they are, so i steer clear. i think they're cute-ish, but i steer clear of these shoes entirely because i don't "get" 'em. so, for what they are, i guess they're okay. A genius observation, 17 beats! I totally agree about the no-curve heel. Never would have thought of that before, though! 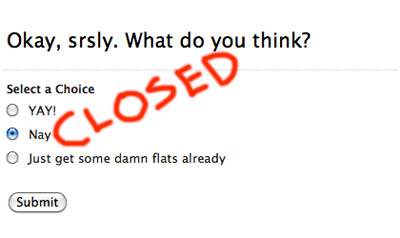 Yeah, they are OK. No flats unless absolutely necessary. The only thing I like about it is the gold at the toe. The heel is too clunky, and the ankle strap needs more substance. Ha! I think they look better on feet. But, hell, it took me six months to find the right heels to wear at my outdoor wedding... and, after purchasing them, I ended up wearing Frye boots instead, so clearly I am not the authority on this subject! I think it is the chunky heel + open toe combo. Those shoes are heel heavy! The Chie Mihara ones you posted feel more balanced. No, they're 90's in a bad way. i know but i love the 90s. and now that i'm drunk i'm pretty into them. i love that you're back. If those shoes were actually these shoes, then they would be minimalist (and awesome), but they would also sink into the soil. I want to change my vote. I thought I liked them, then I saw the photo of them on feet - yuck. Not for me. Ew. Le Chateau. Just need to throw some black, stretchy bootleg pants over those bad boys. It's the black bottoms - too visible from the side. Especially under the toe bed. And it looks like the toe is too square. And the heel needs to taper more. And not be so high. From the ankle strap forward, yes. The heel makes them look like they came from Bakers at the mall.